or you could build a little wall and practice jumping into the house. Looking at that picture, I have to wonder why on earth anyone thought it would be a good idea to put a sunken patio in *anywhere* in the swamp that we live in? I'm surprised the water table isn't nearly that depth; it is in Old Town. After all, now this. Thank God you've got a water sweeper living right in your home! Looks like four inches deep. Our home isn't in flood danger anymore, now that the school schmoozed the city into developing Western. But I do have an Arkansas sudden pop up summer storm story. We were in the middle of a big project when the sky darkened. Suddenly after a single lightening flash, the sky opened it's deluge. There wasn't a single shingle or bit of tar paper on one-third of the roof! Water dripped from the light fixtures. Like you, we survived. But a French drain sounds like a good idea. I'll bet Cantore knows how to do that. It's the least he can do. Indi@, I should've taken pictures from the front steps. Watching all my flowerbed mulch running down the street was a sight. Laura, you know builders. My house was one of the first out here. As the others were built, mine became lower and lower. Next time we'll have sandbags and a bigger broom. Yes, Mike. Jim Cantore owes me one. And he should be shirtless, because um, it'll be hot out and such. Amazing that you all got so much rain, and we didn't get a drop! 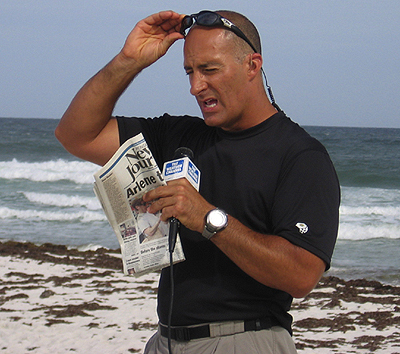 Yes, absolutely, Cantore should be shirtless. If Jim shows up, Pat, I'll be sure to have you over. We could fetch him iced tea every half hour or so. Hydration is important. I can't comprehend the notion of trying to sweep water, Monda. I don't understand it whatsoever. You crazy Southern folks have foiled me yet again. brian-schroeder.blogspot.com totally just wrote about the hot sun too! Except his was before any massive rain storm. Still waiting on that in the midwest. Julia, down here we sweep everything. What we needed, though, was a giant squeegee or a truck load of Sham-Wow. Christie, look out. When the rains come on such barrenness, it's nothing but flood. Build an ark while you can. I'M with Julia up there. Just Sayin. Don't worry, Em. 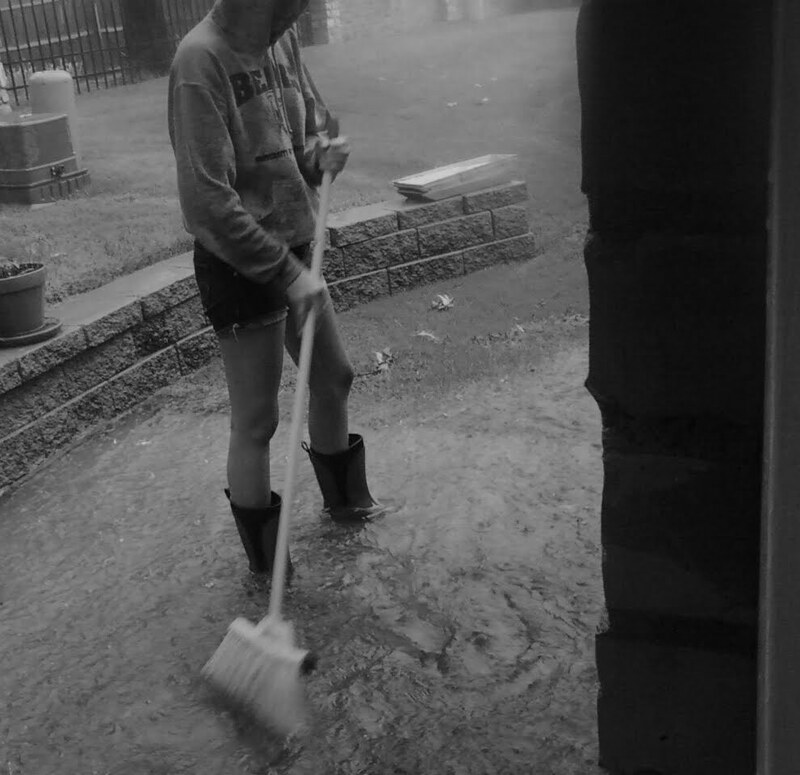 I'll buy you a matching slicker and rainboots for next time. Maybe even a cute hat. Is that you with the mop?! 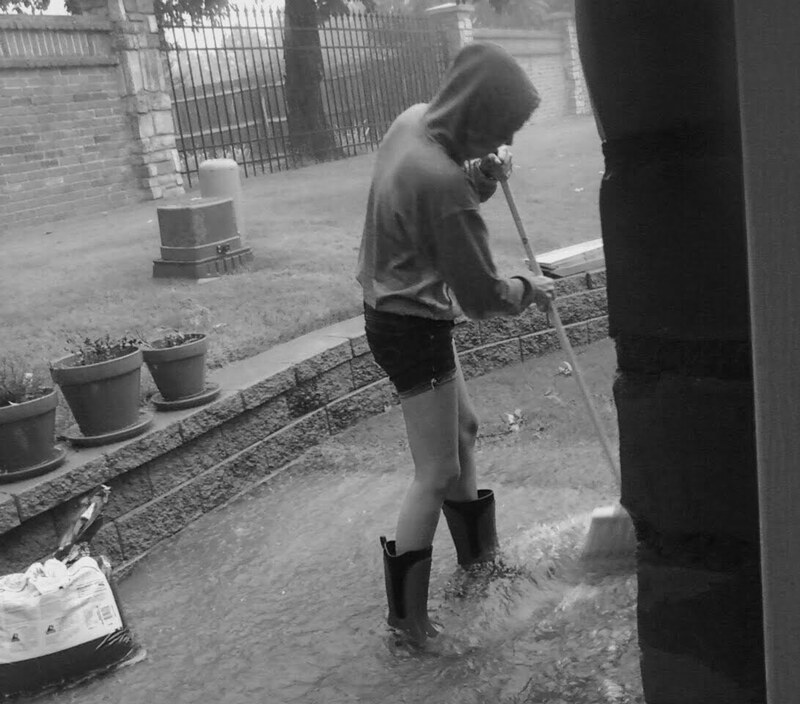 Cut off's and wellies….love it! Me? No, that's my daughter Emily slinging water and sporting the cut-offs. The wellies are mine, though. I can't TELL you how happy she is that I posted these pictures! I'm not sure who Jim is but I think I need him for a paint job. It's hot in New York so he can just leave his shirt at home. Does he like sweet tea or just lemon? Love the Em pics. We've done the sweep thing in our basement. Then my daughter had a brilliant idea and we just started pumping it into the utility sink. I always wondered what that thing was for, now I know. Gypsy, I almost linked to a picture of the shirtless Cantore. Glad to hear we're not the only women sweeping water, although none of should have to.